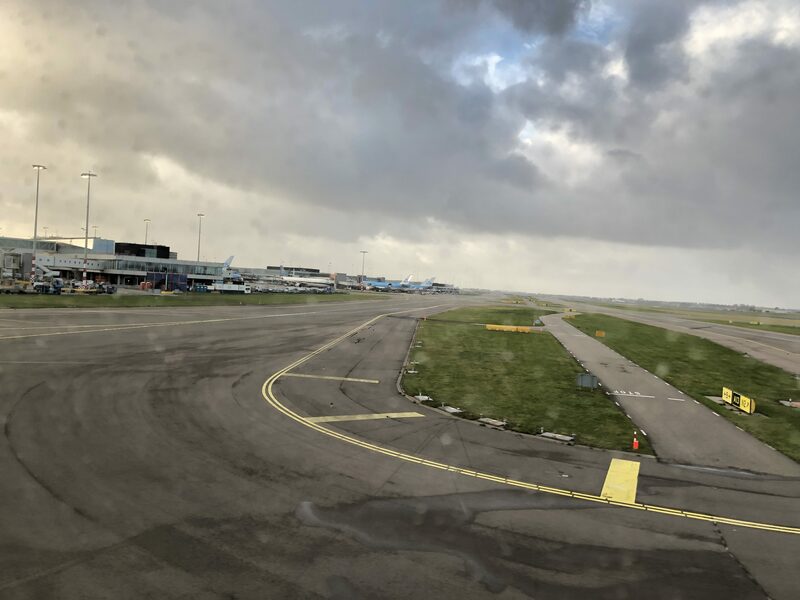 After sprinting from my KLM flight from London, I made it onboard a few minutes before ground staff shut the forward door. 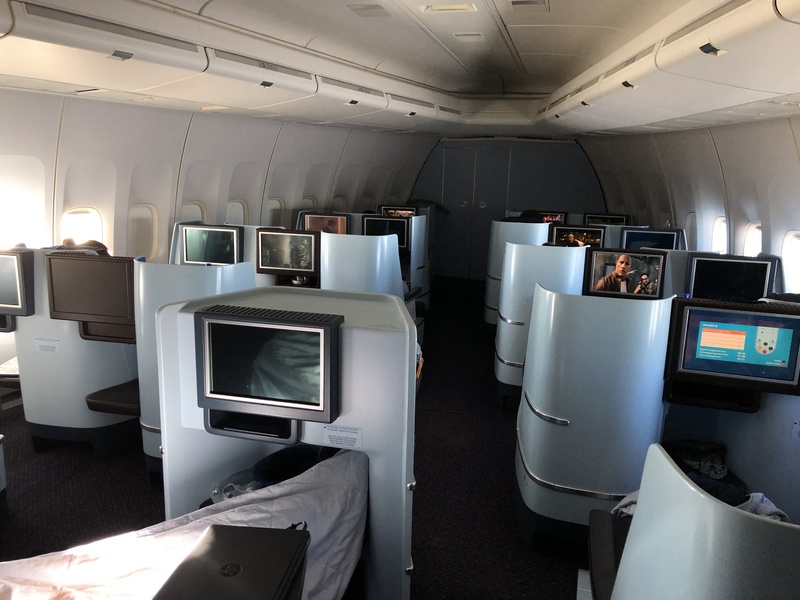 After boarding through the forward door, I turned left into the nose section of the business class cabin. 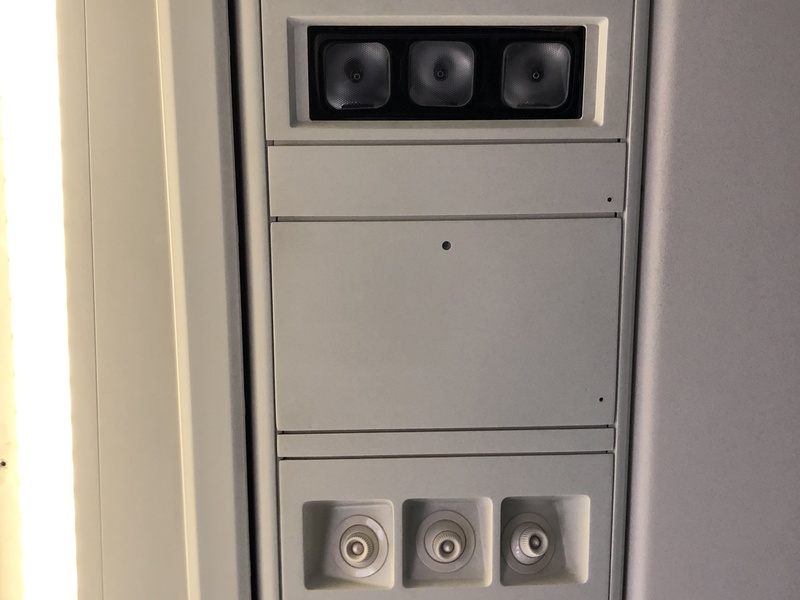 This is a picture I took mid-flight but shows you the jumbled mess that the nose cabin is which I mentioned in the preview to this trip. The right side of the nose are all paired seats where on the left side, rows 1 and 4 have single seats while rows 2 and 3 have double seats. Also, the random middle single seat is 4E. 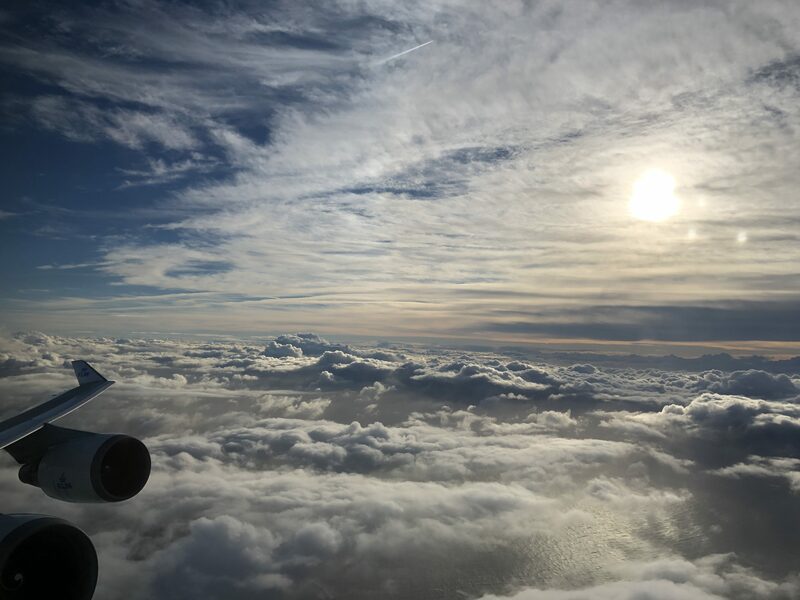 I chose seat 4A for the flight to Toronto and I quite frankly think it’s the best seat on the aircraft and I’ll tell you why. Firstly, it’s a single seat so I get direct aisle access anytime I’d like. 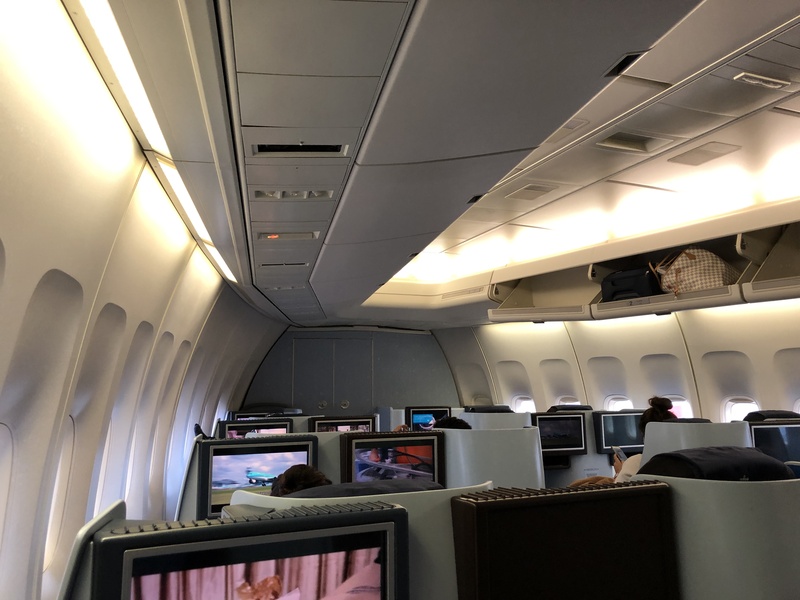 Secondly, the console to the right of the seat is the largest of any of the business class seats so I get more space than anyone else. 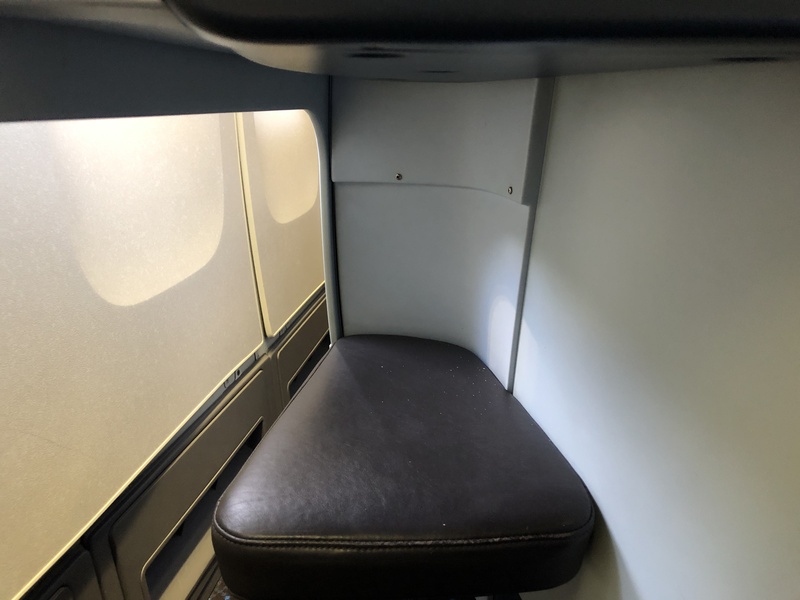 Now one could make the argument for 1A and 4E but here’s the issue with those seats. 1A is probably a close second, but due to that seat being at the very front, it’s a bit more compact and not as roomy. In seat 4A, I have extra storage space between the seat and the window. 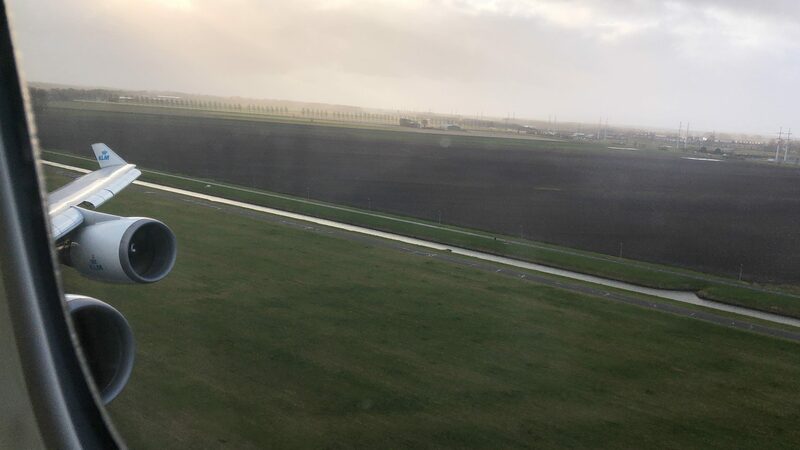 As for seat 4E, well 4A has windows and 4E doesn’t. Now let’s talk about the seat itself. 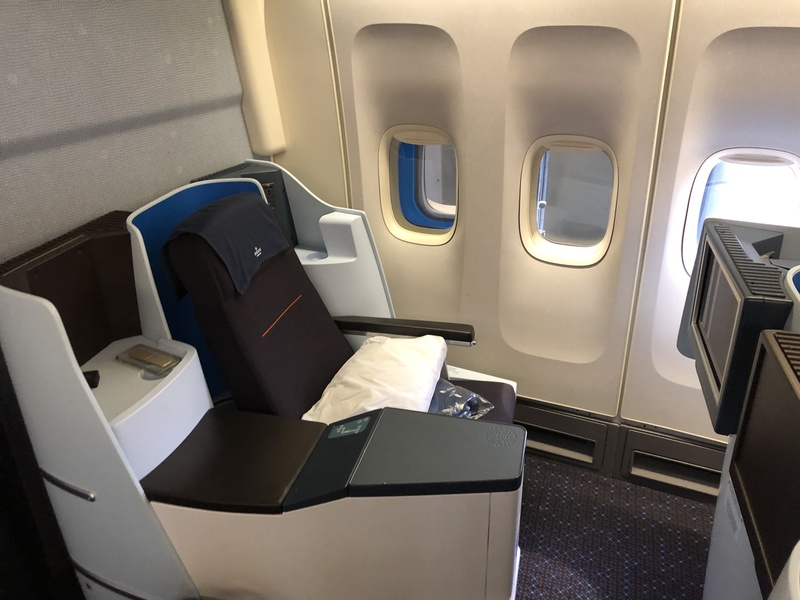 It’s quite similar to other B/E Aerospace diamond business class seats like United for example. The seat cushion was quite plush which I like, especially when in a seat I’d be sitting in for a long time. The back padding was more firm at the time, but there’s actually seat controls that can adjust that which I’ll show you soon. 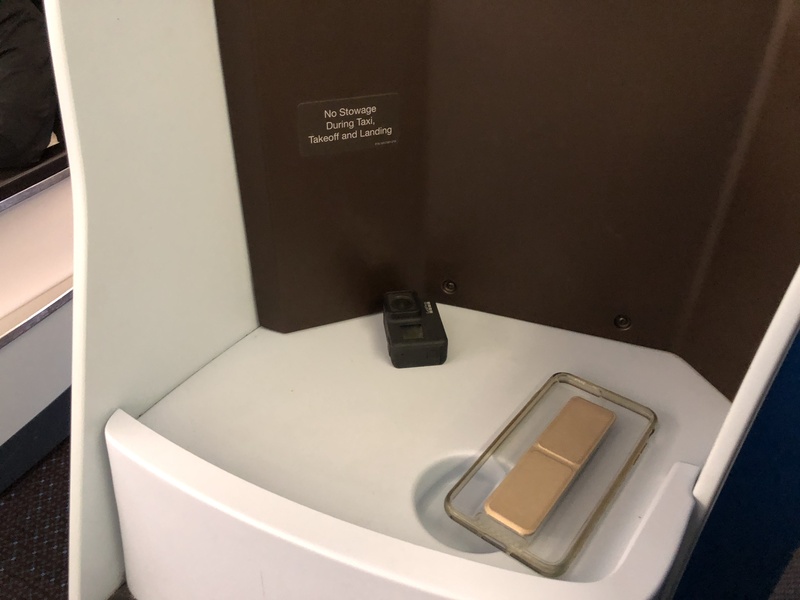 Within seconds of sitting, a crew member brought around amenity kits and offered a choice between water and orange juice pre-departure. 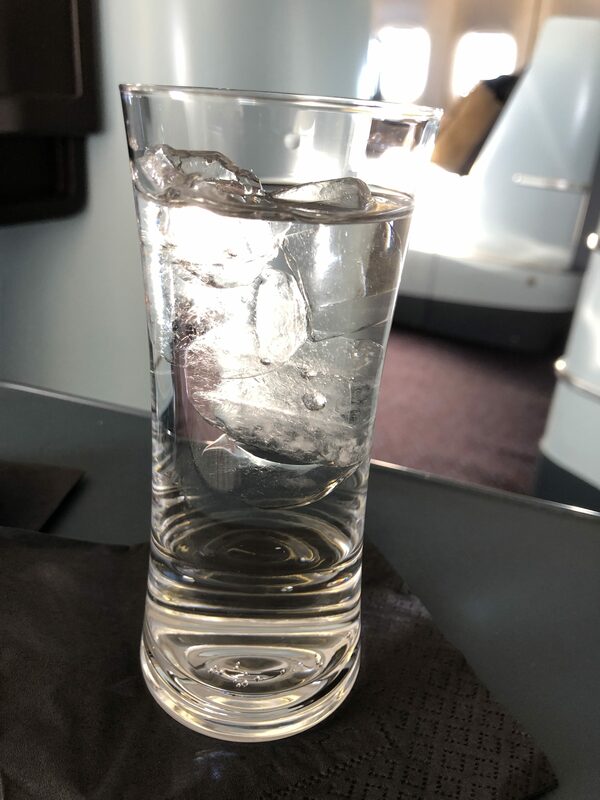 I went with water and I was especially thirsty given the running I did through the terminal for a while. 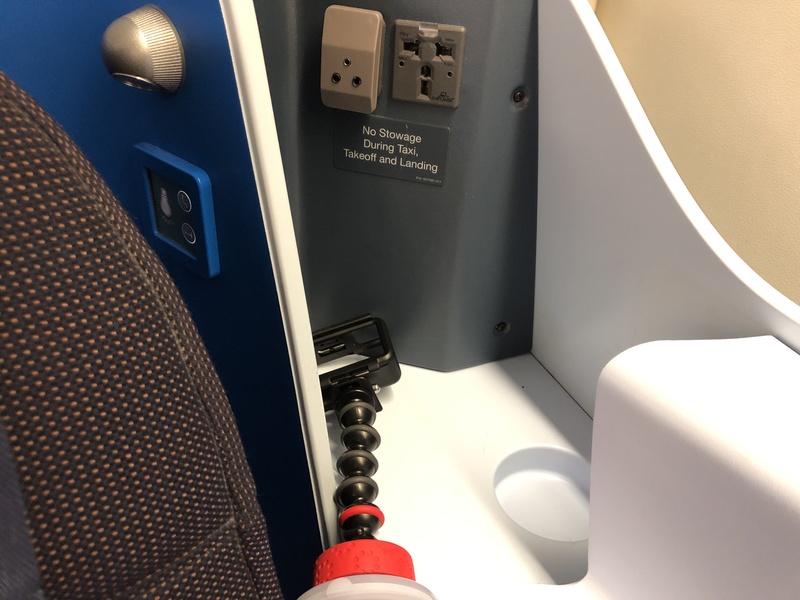 To the left side of the seat and behind, there was a power port which was in a pretty inconvenient spot if you ask me. Here was also the headphone jack for the headphones provided which I’ll show you. Also note behind the seat is a reading light which is designed for when the seat is in the flat position, and this seat does go fully flat. The right side of the seat and behind there was also plenty more storage and a cupholder. 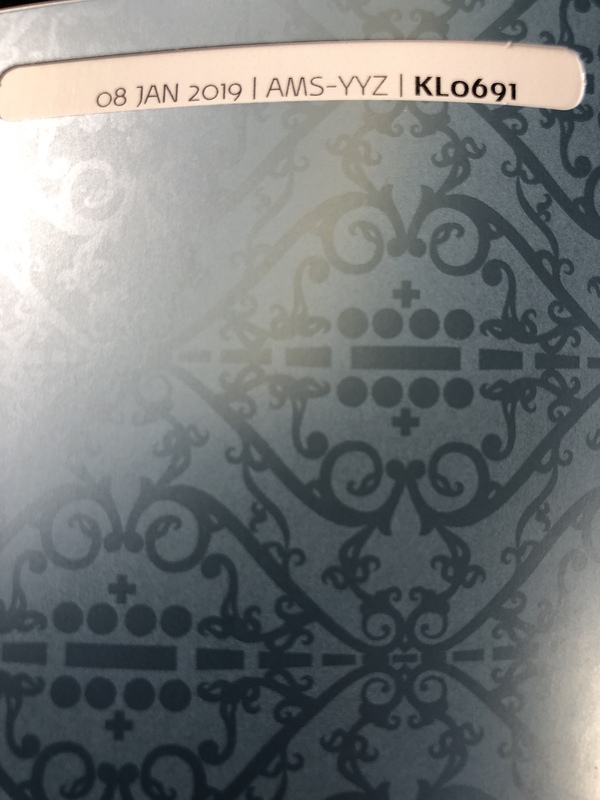 There was also an ottoman to place your feet on, though it was rather narrow and, in most other seats, can be especially tight and uncomfy when in the sleeping position. 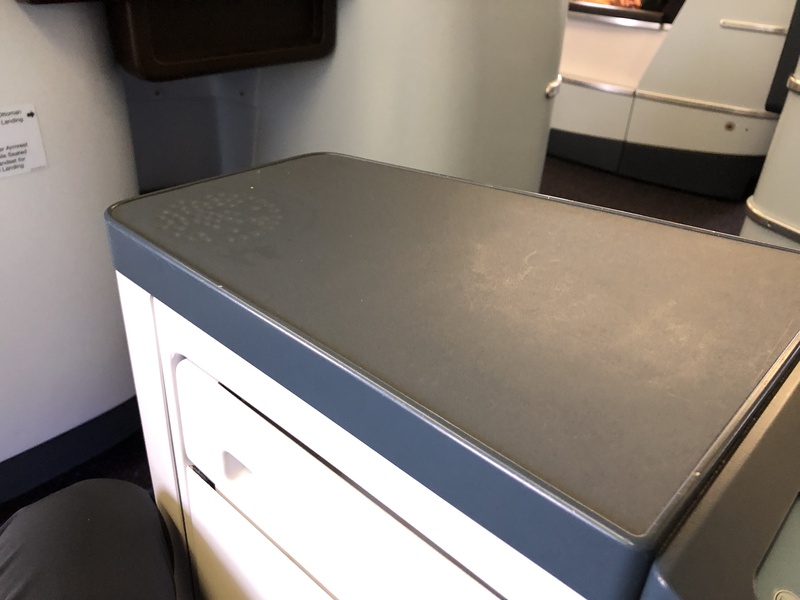 However, in seat 4A, thanks to the curvature of the plane, there extra space to rest your feet outside of the seat area. 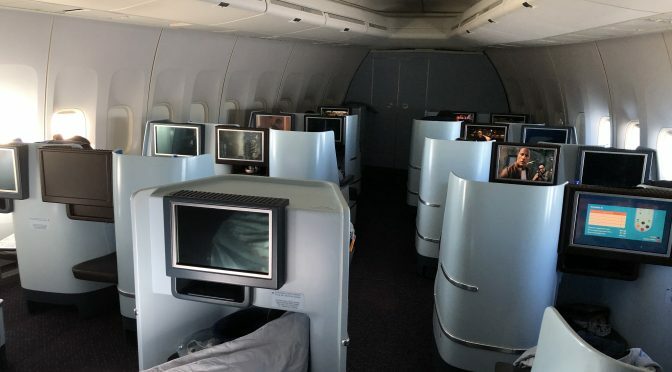 Here’s another look at the cabin from my seat. 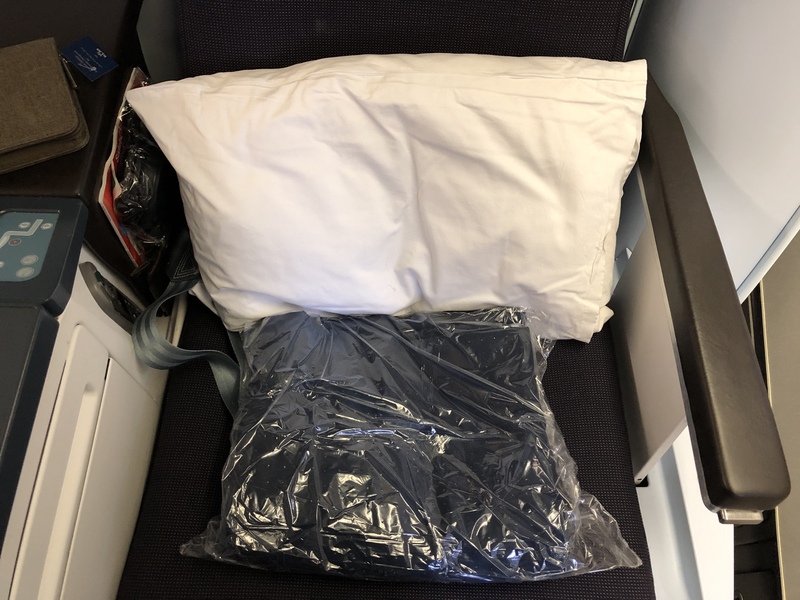 Also provided at the seat itself was a pillow and blanket. The pillow was nice and plush however the blanket was just alright. It wasn’t especially soft though it wasn’t scratchy either. 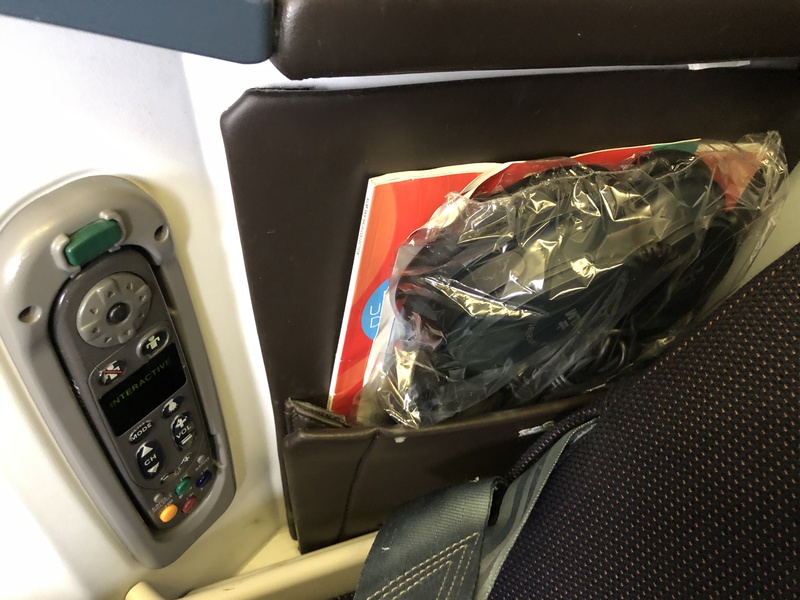 Around your hip area on the right side of the seat, you’ll find the “noise cancelling” headphones that KLM provides along with the remote controls for the TV. 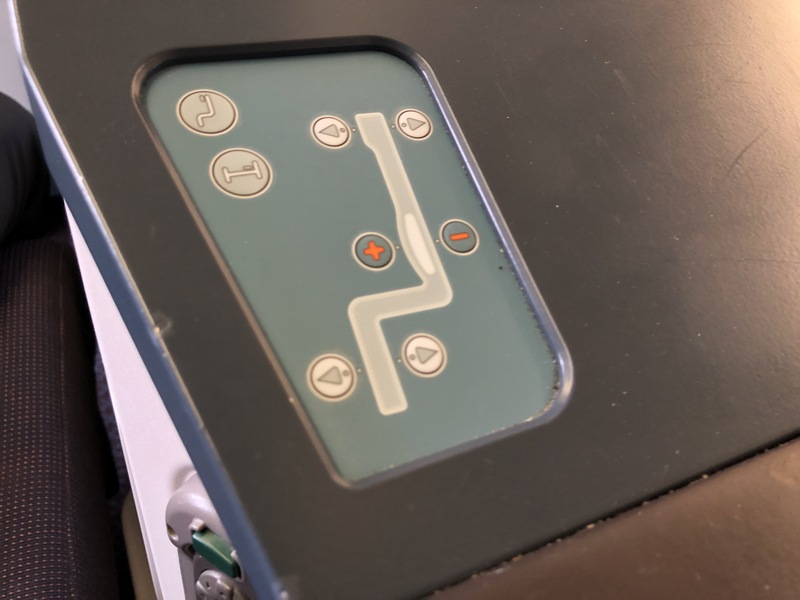 Now along the center console, you’ll see fairly straightforward seat controls where you can control the angle, the hardness of the seat, as well as the recline. And as I had said earlier, the central console is pretty huge on this seat. 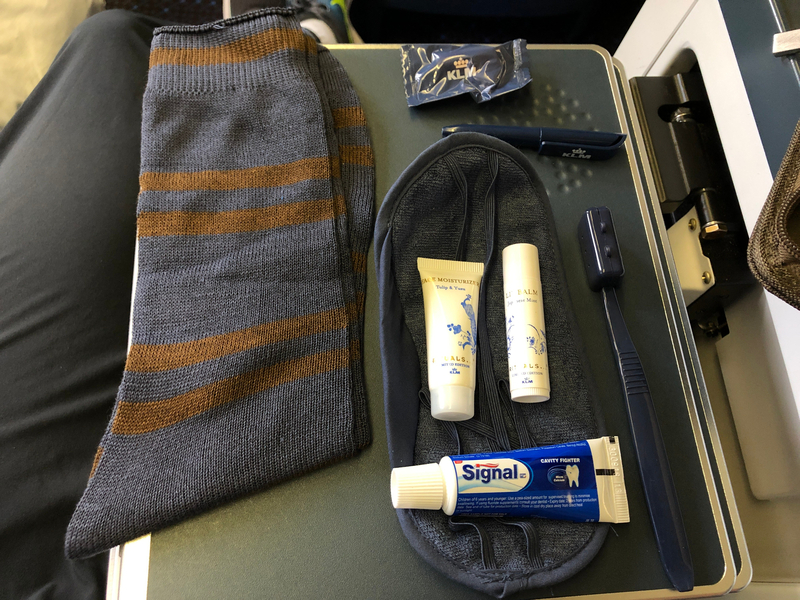 Let’s look at the amenity kits that were brought around. 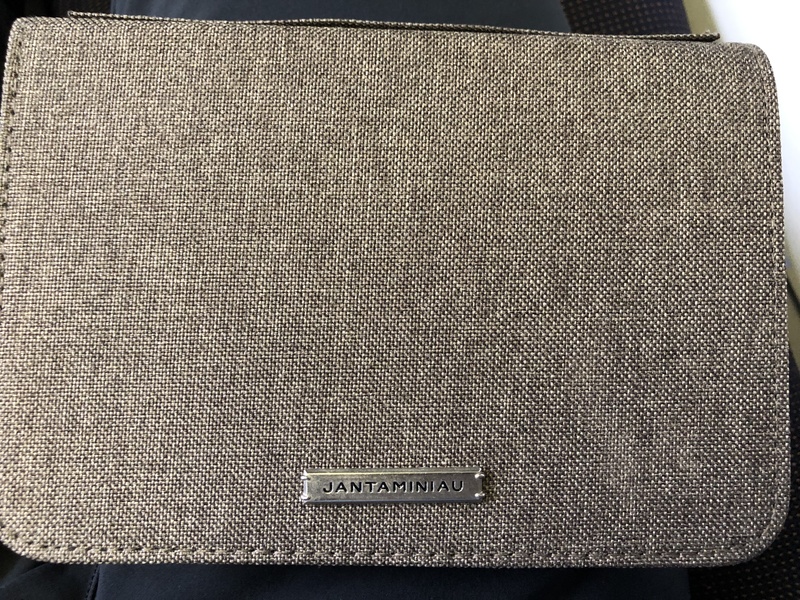 From what I noticed, there was a male and female amenity kit. 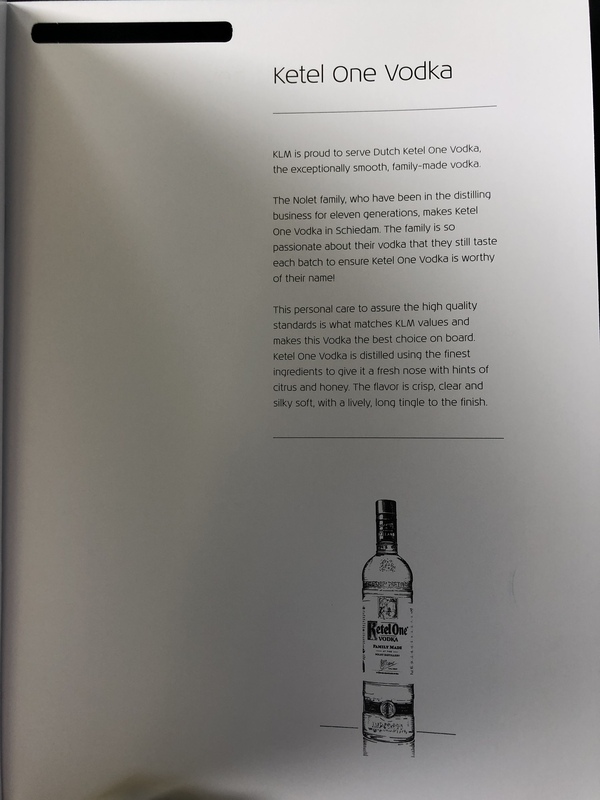 The contents were fairly standard, though it was more than what I needed on a daytime transatlantic flight. 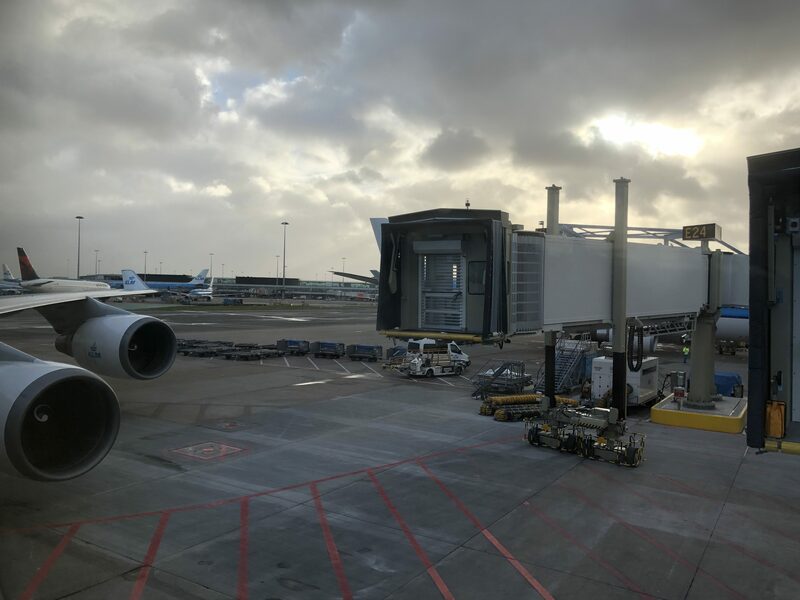 Finally, we began pushback around 30 minutes late. 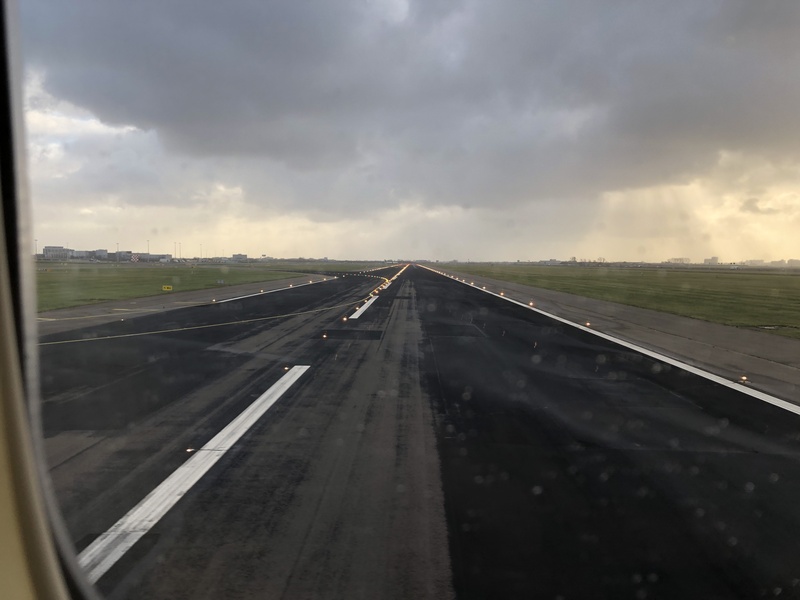 After a long taxi to Amsterdam’s furthest runway from anything…runway 36L aka “Polderbaan”, we had a long takeoff roll and a choppy climb out of Amsterdam. 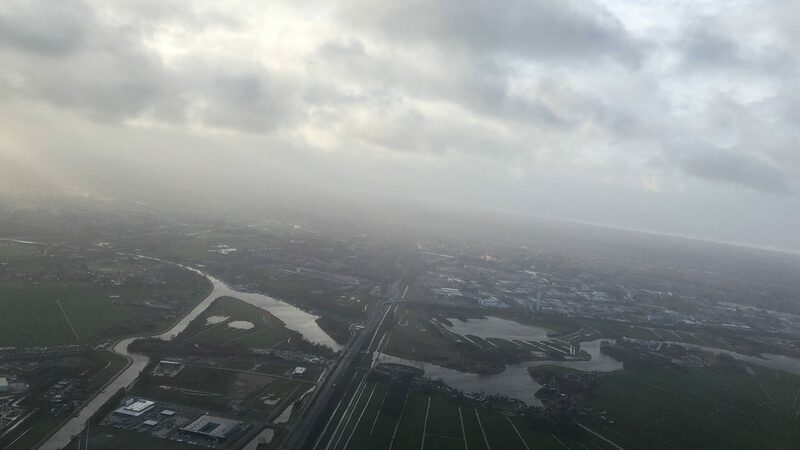 Because of the clouds, glare, and direction we were flying, you really don’t get too much of a view of Amsterdam itself. 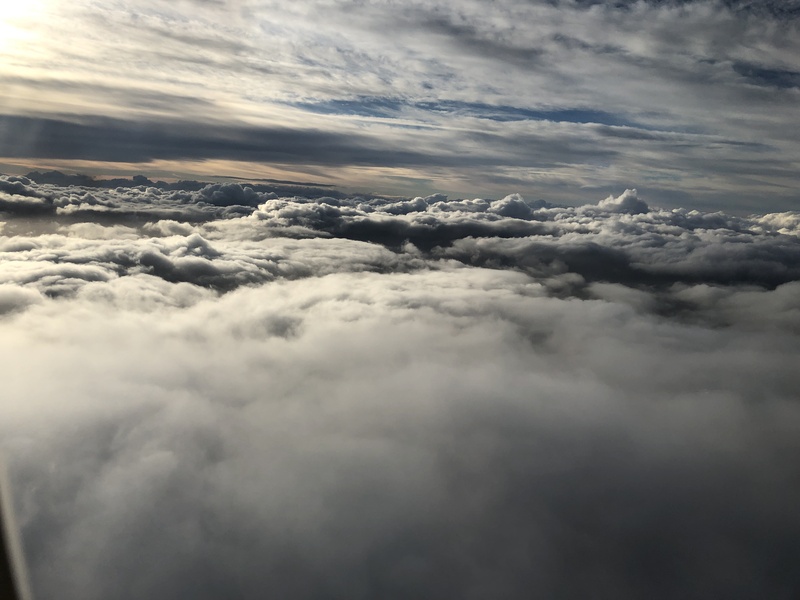 But as we climbed above the cloud layers, the views became better. 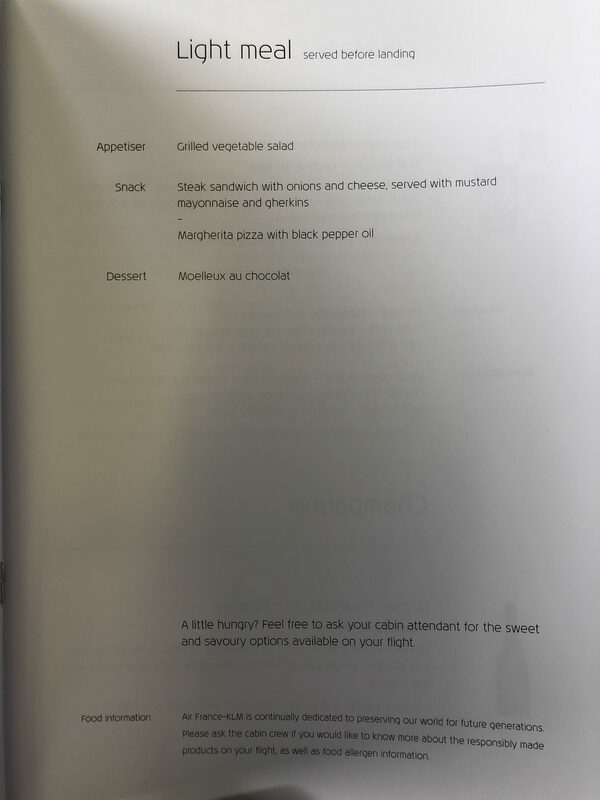 About 5 minutes after takeoff, the crew working the nose cabin came around with menus from the flight. 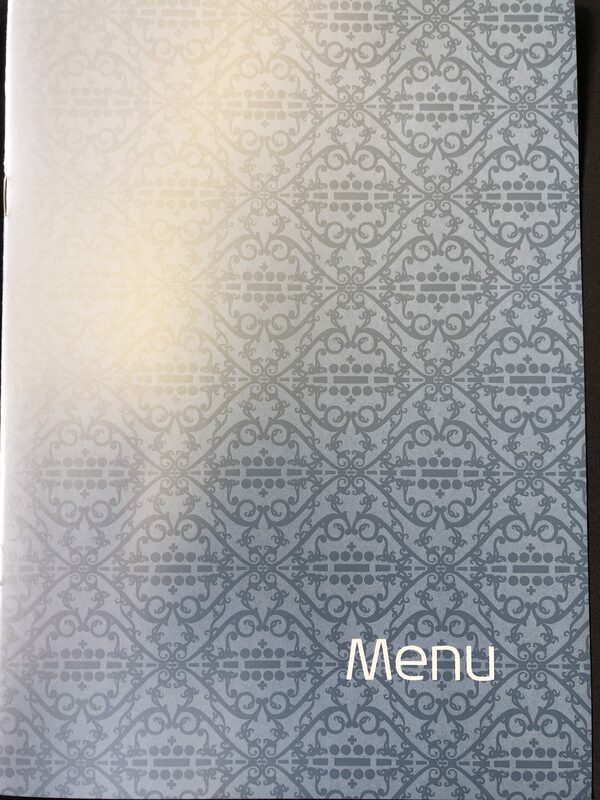 Looking at the menu, I was actually hungry and ready to eat for a change. 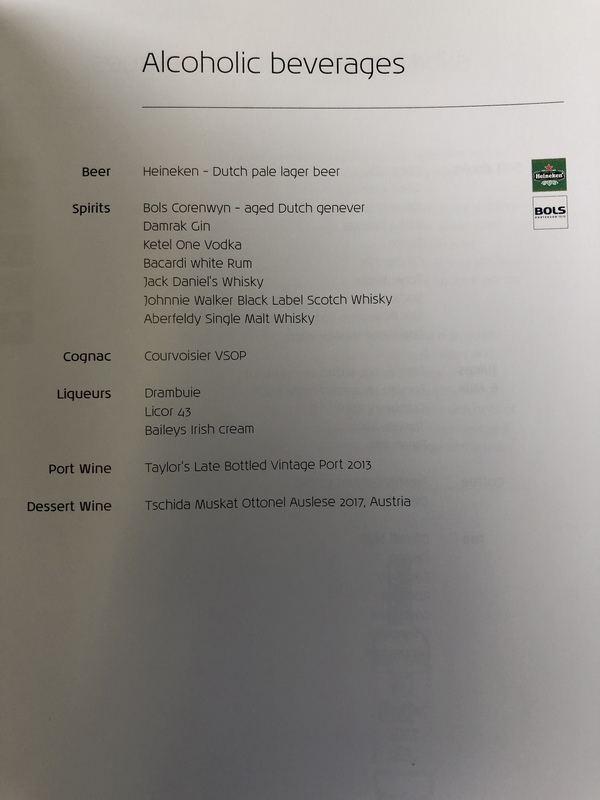 That might also have been because I ran from my previous flight and didn’t even get to catch a bite in the lounge, but in either case, the menu looked pretty nice. 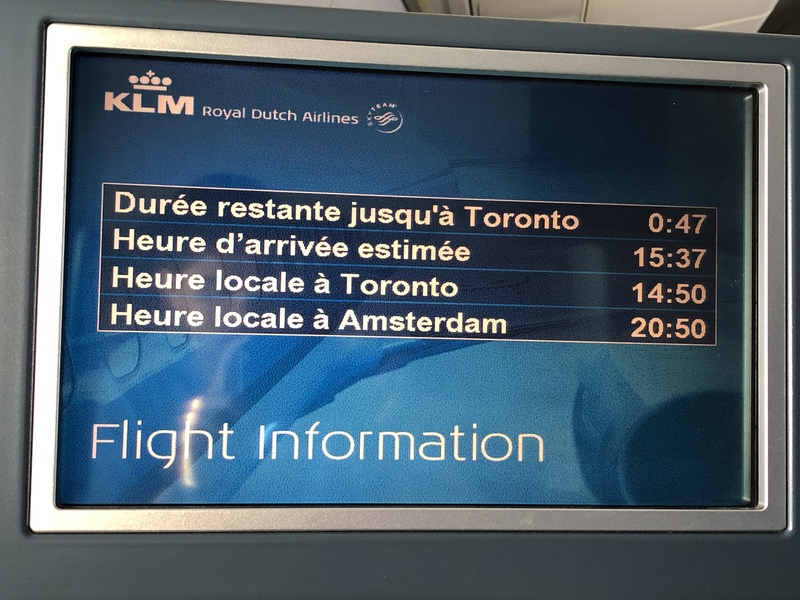 It was also a nice touch to have the date, route, and flight number shown at the back, as well as Toronto being in big letters on the first page. 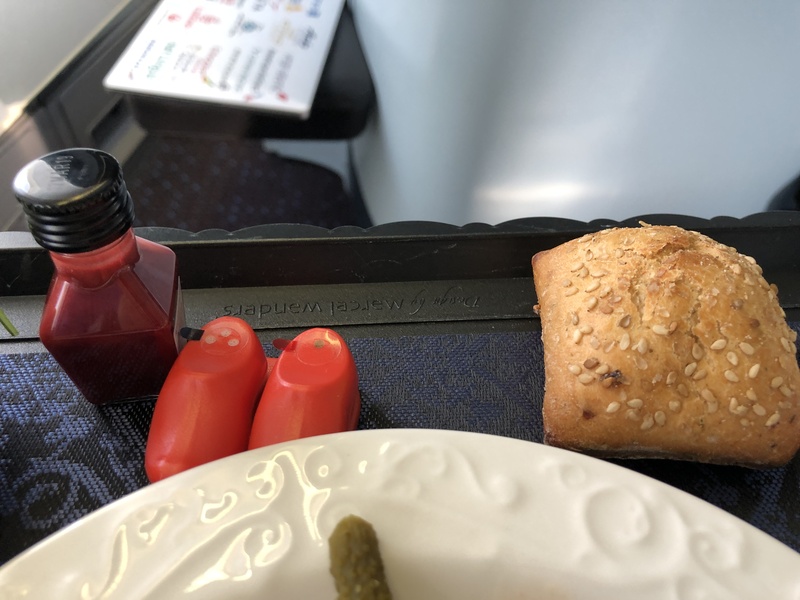 A hot towel was brought around about 5 minutes after menus were brought around. 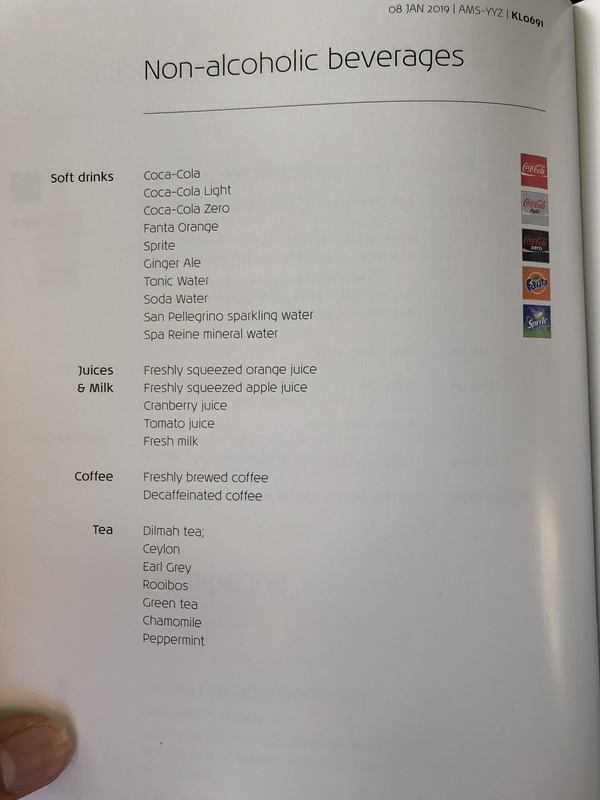 25 minutes into the flight crew began with drink service and a snack. 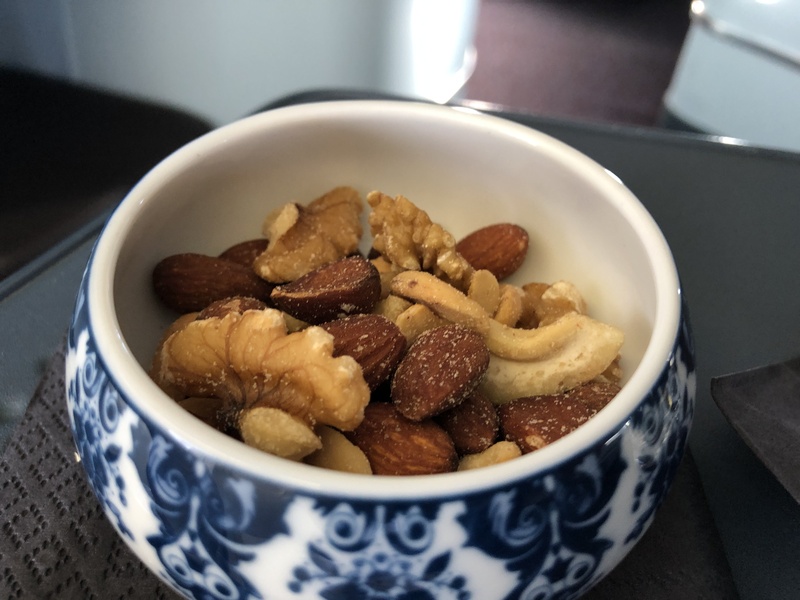 For your snack, you had a choice between nuts and cheese which was nice to have, however, given that dessert included cheese, I decided to go with nuts. For my drink, I went with the same as always, sparkling water. I went with the former, though surprisingly most of the cabin went with the latter. The beef itself was really tough, but other than that, the appetizer was awesome! The beef mixed with garlic cream along with the veggies and the additional sauce provided by the crew created for a tasty mix of flavors in my mouth. There was bread which was warm and tasty with peppers inside it. The bottle to the left was beetroot sauce. Now the salad was dry as expected and the beetroot sauce added flavor to the salad, though it was not a very tasty addition. 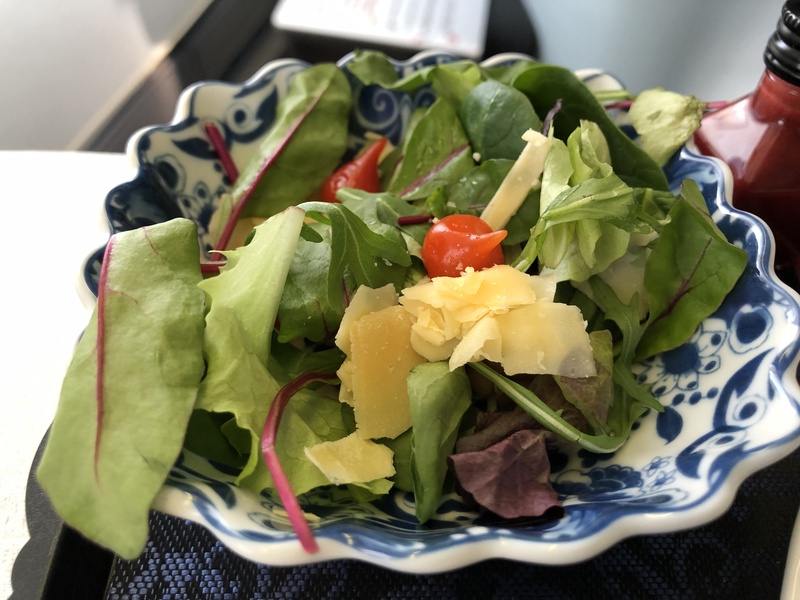 It didn’t go very well with the salad but nevertheless it was still decent and I was hungry. 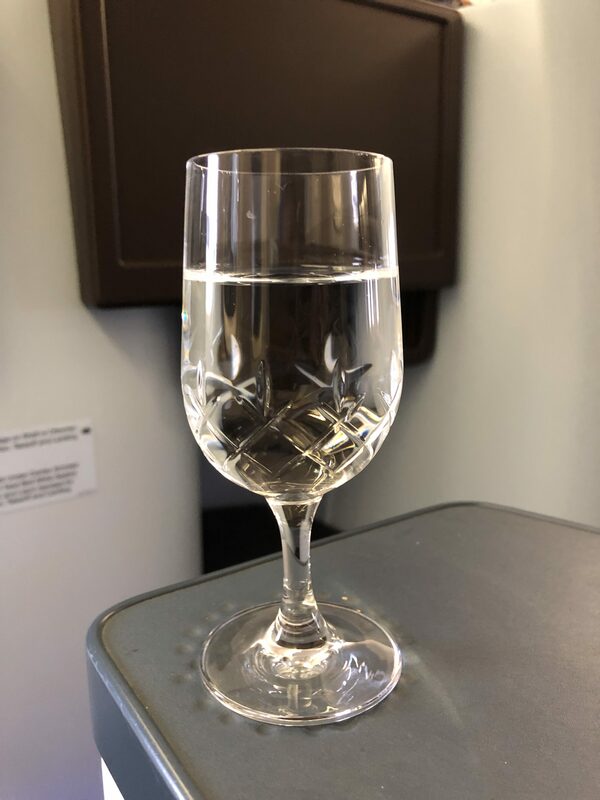 Once I was done with the appetizer, the crew immediately came and collected my tray and refilled my sparkling water. 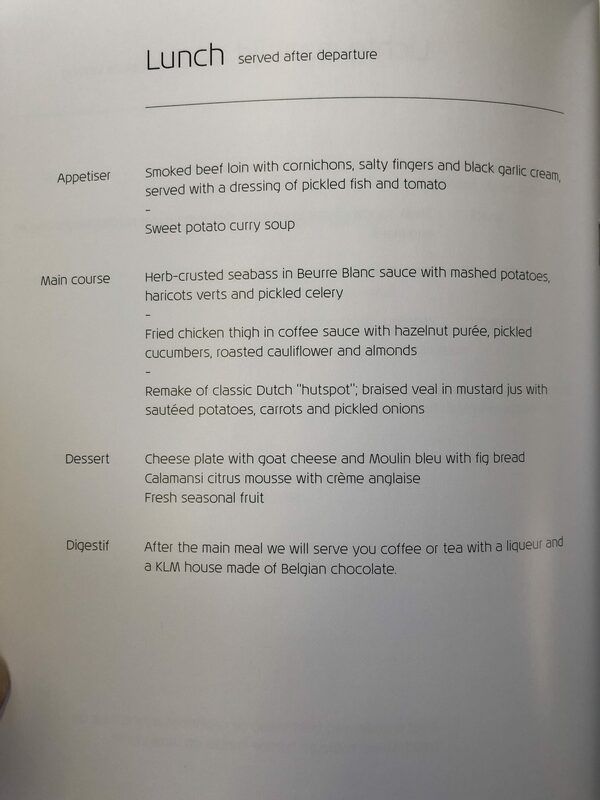 I wanted to try the most Dutch thing on the menu since I was on KLM, so I went with the veal. But the other two options sounded just as good. 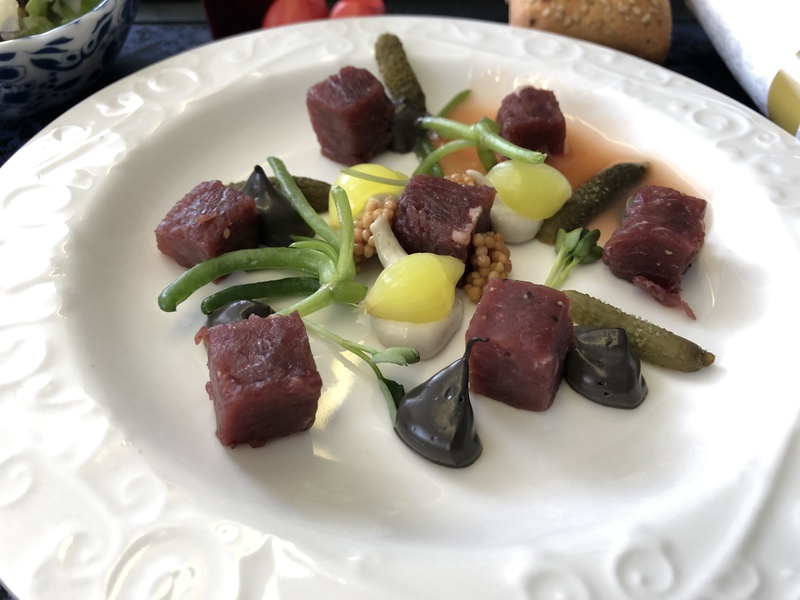 The veal itself was really tough, though I’m not too mad since it’s hard to do meat right on an airplane. That being said the dish was just about decent. 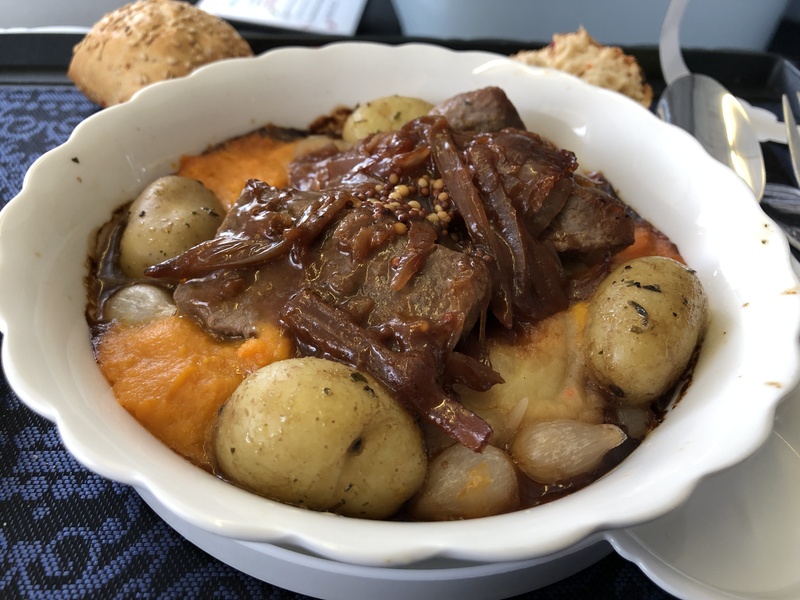 The sauce was nice and onions went well with the veal, but the potatoes and sweet potatoes were bland. Overall, this was a bit of a letdown to what I was expecting, but still overall perfectly edible and enjoyable. 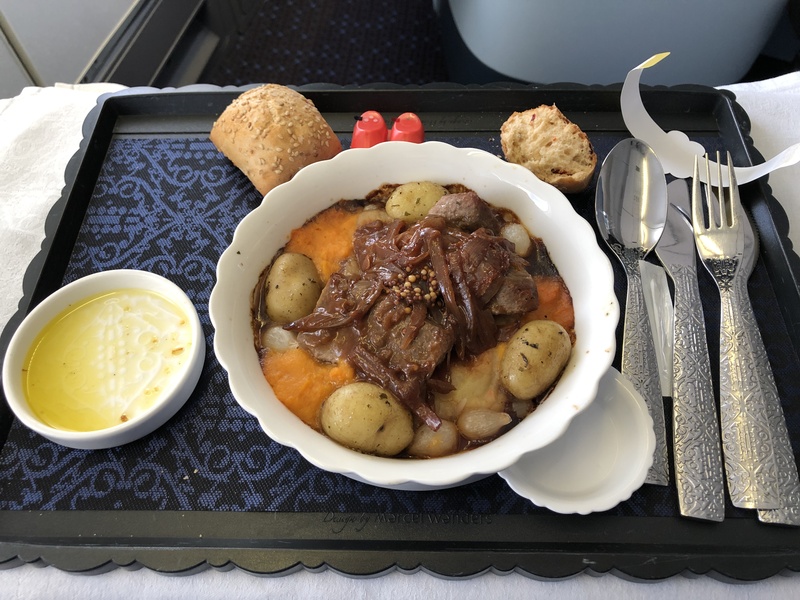 I’ll be honest, if this were served on the ground, it would easily be 100 times better, but food is just harder to do right on a plane. The crew working the nose section was great too. 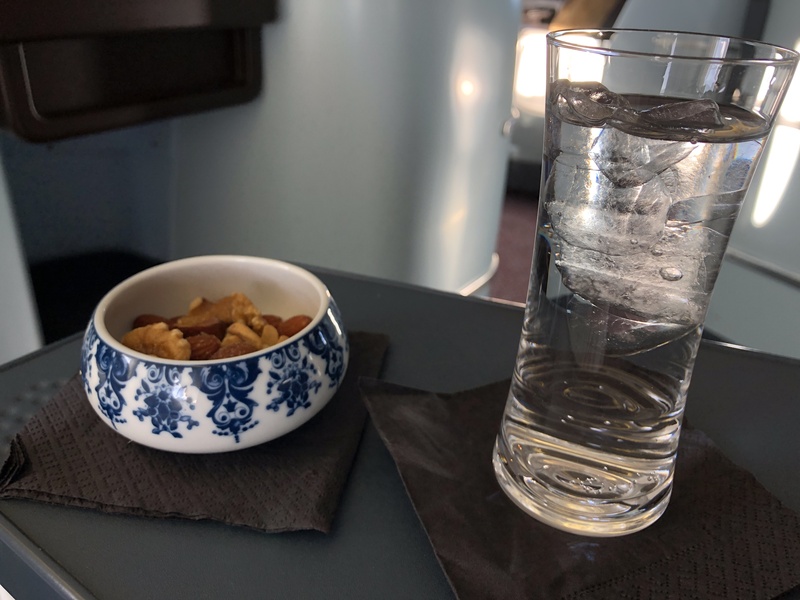 Not only did she refill everyone’s drinks in between meals, but she also asked each passenger how they liked that particular course rather than just collecting trays and moving on. Initially, I had the citrus mousse. But I asked the crew if I could have the cheese plate in a bit and she gladly said of course. She said I could have it anytime I’d like and just to let her know when. Cool! The citrus mousse was beyond delicious! I mean, it was so light, airy, and just dissipated in your both. I thought it was extremely tasty and a great finish to the meal. Man, I wanted to eat more but had to resist. 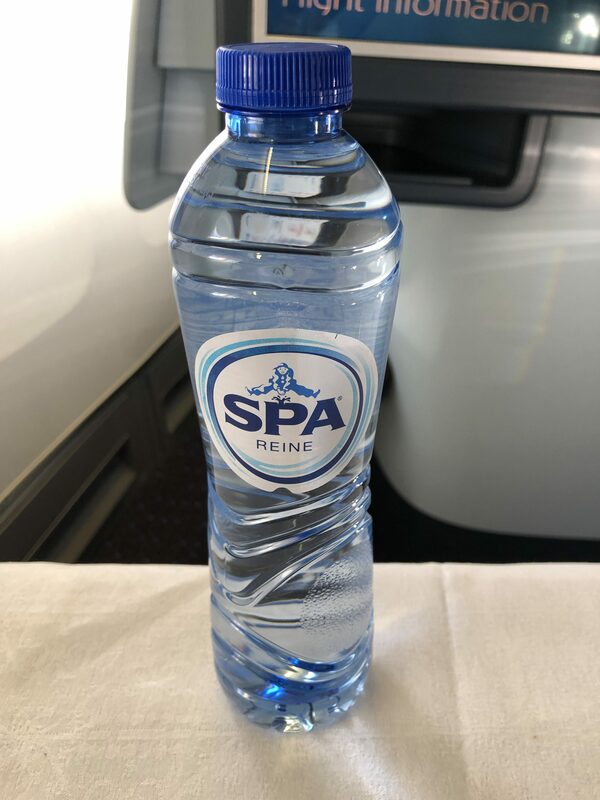 As we were enjoying dessert, the crew came around with water bottles for everyone in the business class cabin. 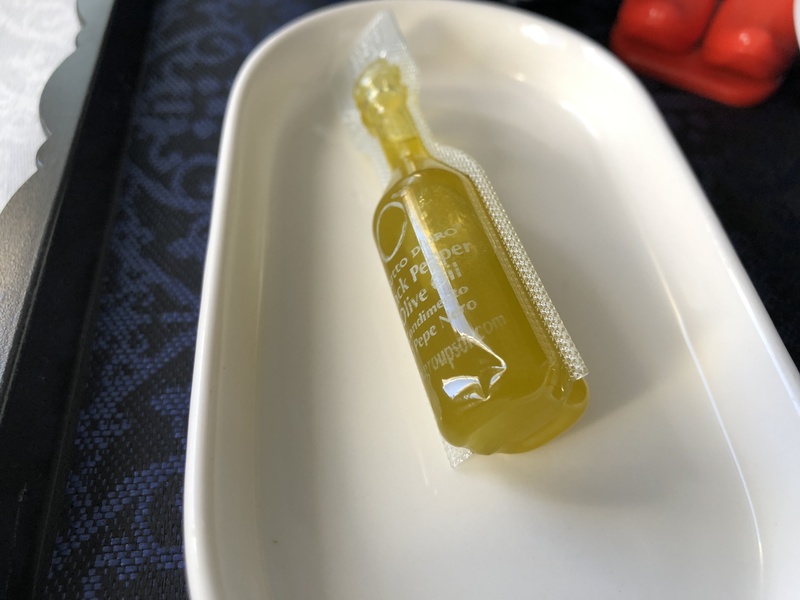 It was honestly bigger than bottles I get on other airlines after a meal service. 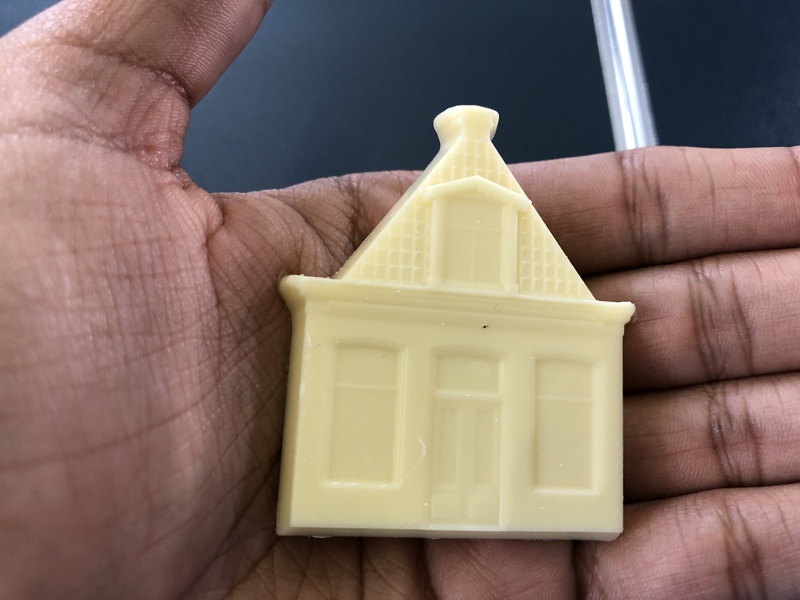 There was also a box of chocolates the crew brought around and I took the last white chocolate. It was tasty! The last service aspect was a tea and coffee service. I went with peppermint tea to finish. 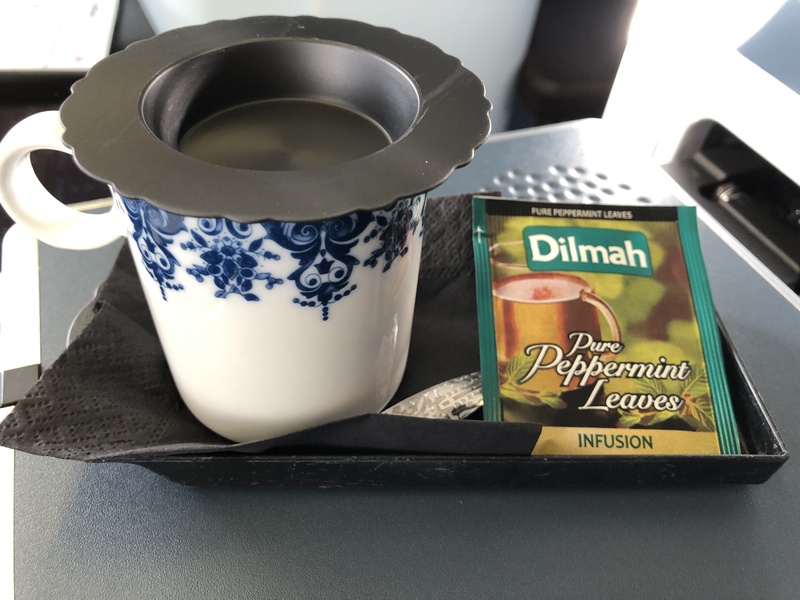 From appetizer to tea, the entire service was done in an hour which is perfectly fine and we had 5 hours and 13 minutes left in flight. Overall, I was pretty happy with the food across the board. 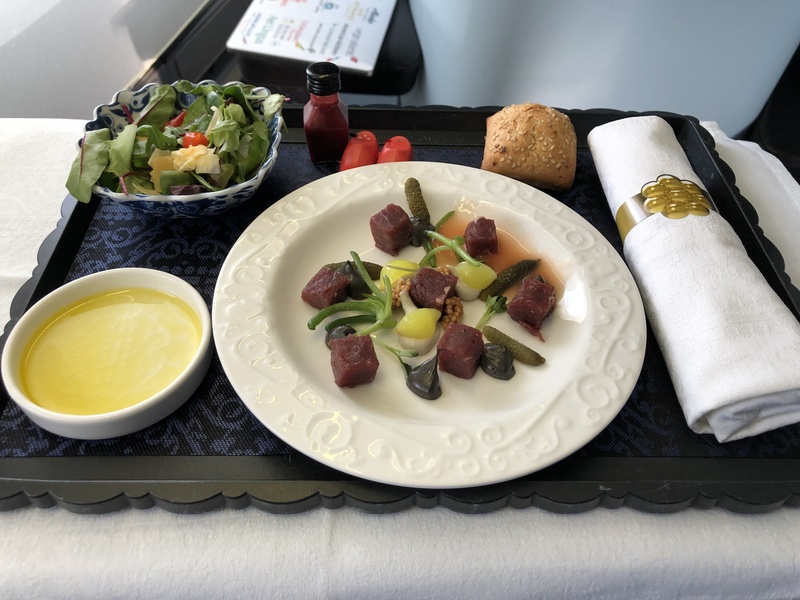 I only took issue with the cook on meats but that anyways is pretty hard to do right on a plane. 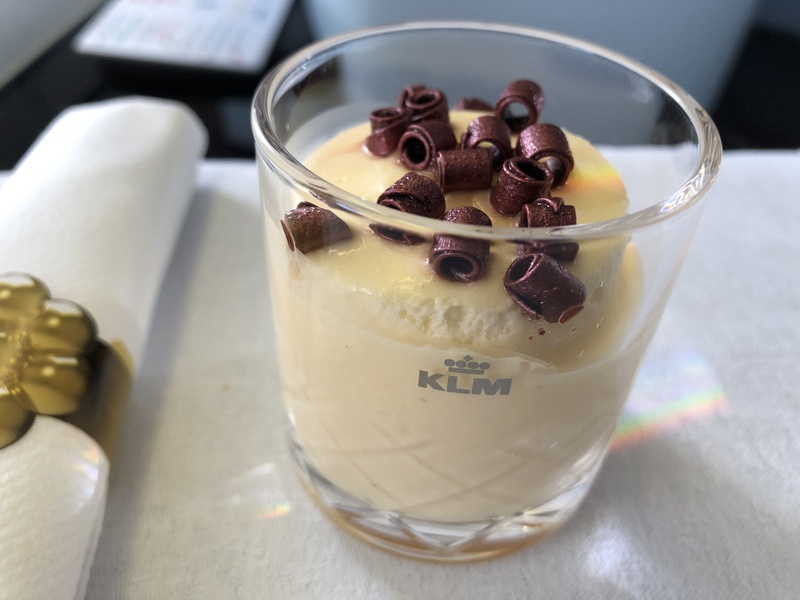 So it was a great meal by KLM overall! 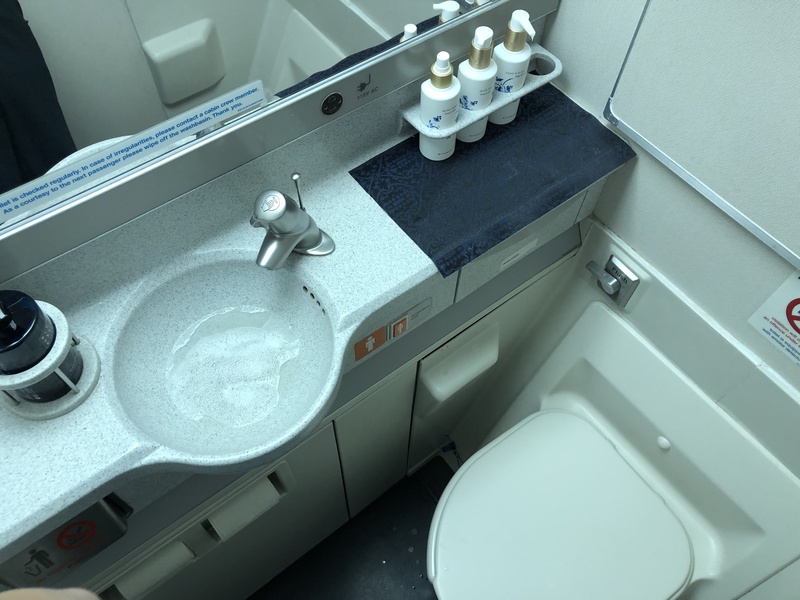 After lunch I went to see the lavatory. It was fairly standard. 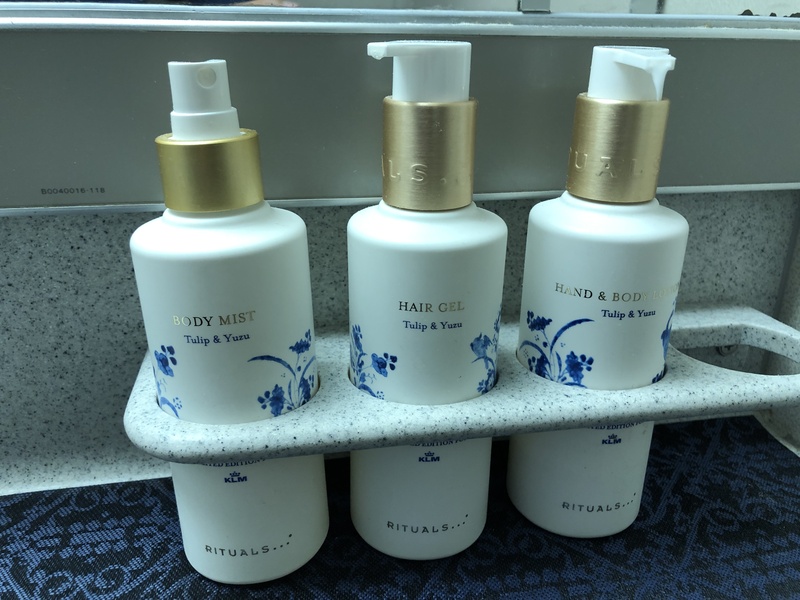 Though there were some Tulip & Yuzu toiletries, including a hair gel. I’m not sure how that works without a shower but I’m guessing it dries off pretty quickly. 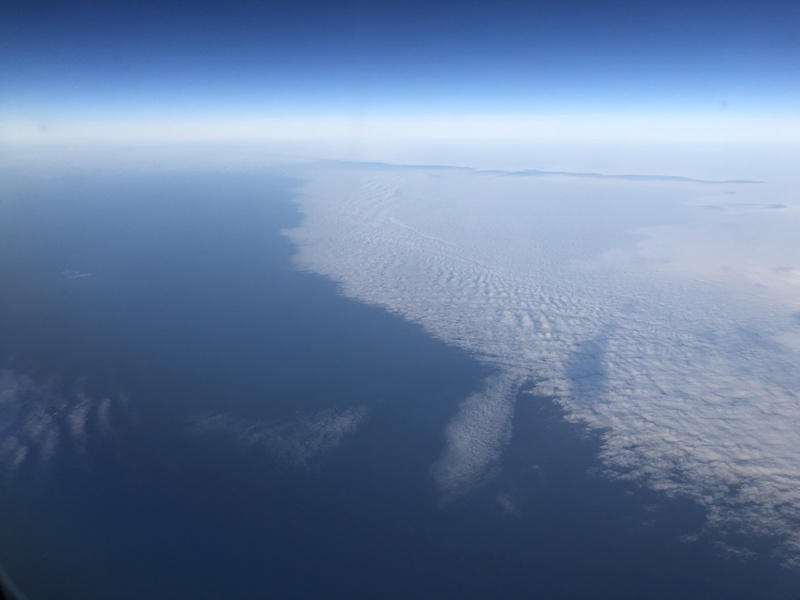 At this point, we were crossing over Greenland. 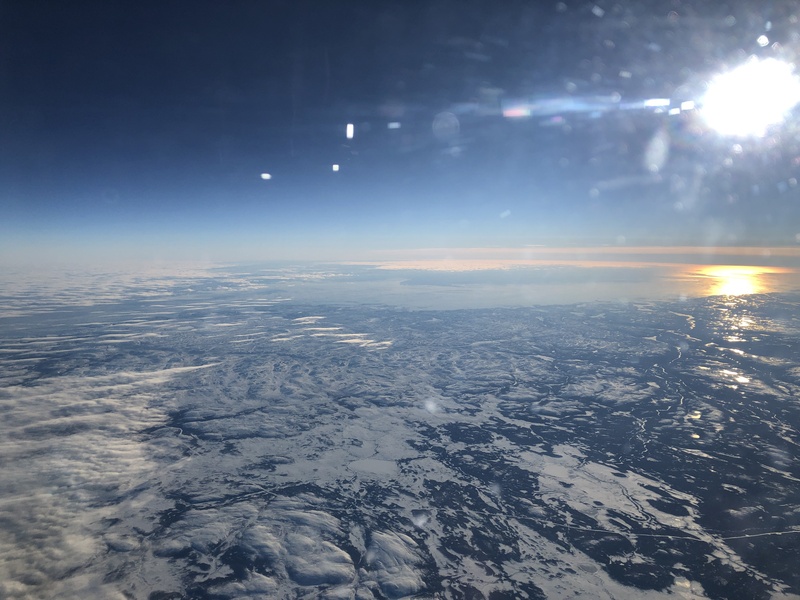 Sadly, Greenland, a place of views especially near the southern tip, was not visible due to the fact that there was cloud cover the entire flight over Greenland. 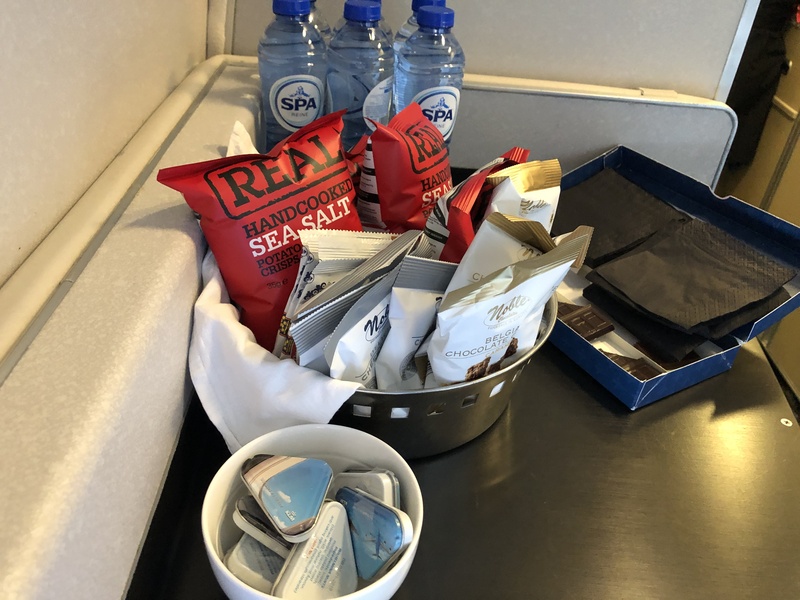 In the business class galley, there was a snack set-up with chips, chocolate, mints, some sweets, and water bottles. 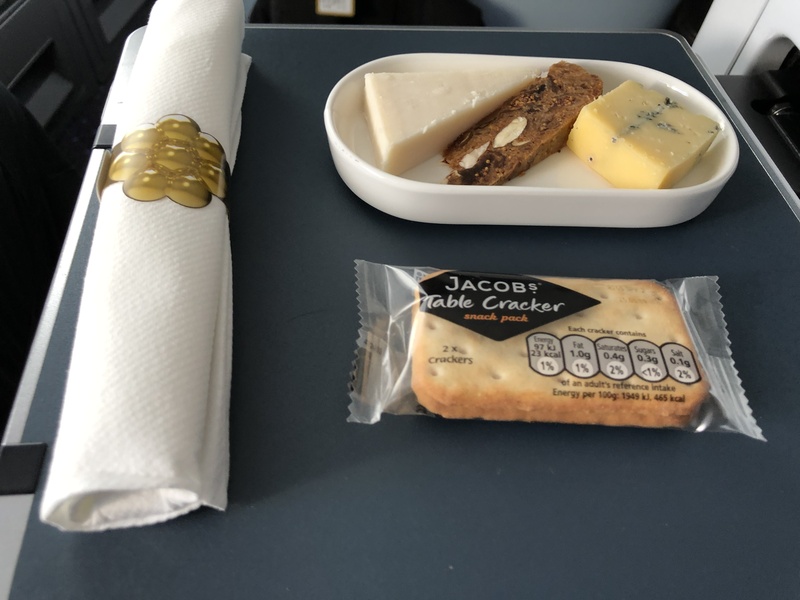 A couple hours passed and I was hungry, so I went to the galley to the crew that offered to bring me the cheese plate mid-flight and she brought it out. She even brought out a table set and laid everything out nicely. There’s nothing too much else here. I love cheese, particularly stronger ones, and this one was good too. The fig cake was a nice addition as well. Finally, we crossed into North America over New Brunswick I believe. 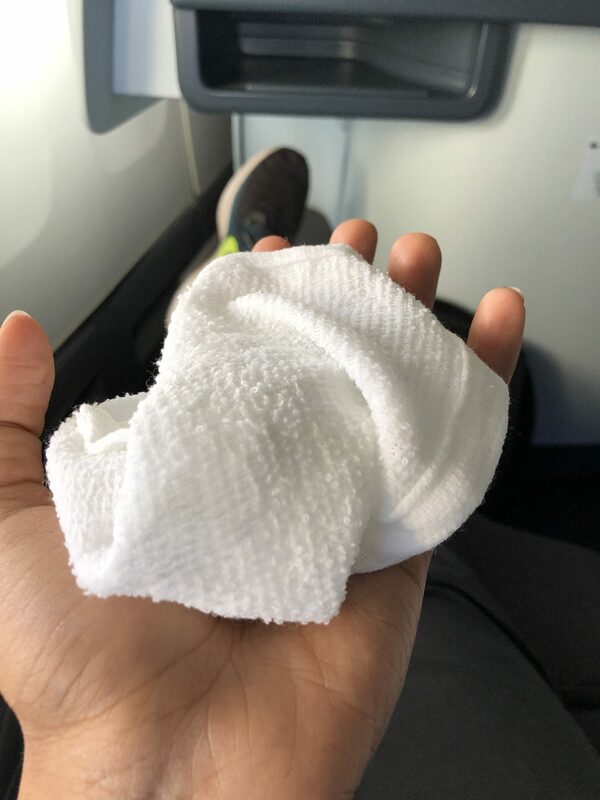 About 2 hours 10 minutes prior to arrival, the crew brought around another hot towel service. 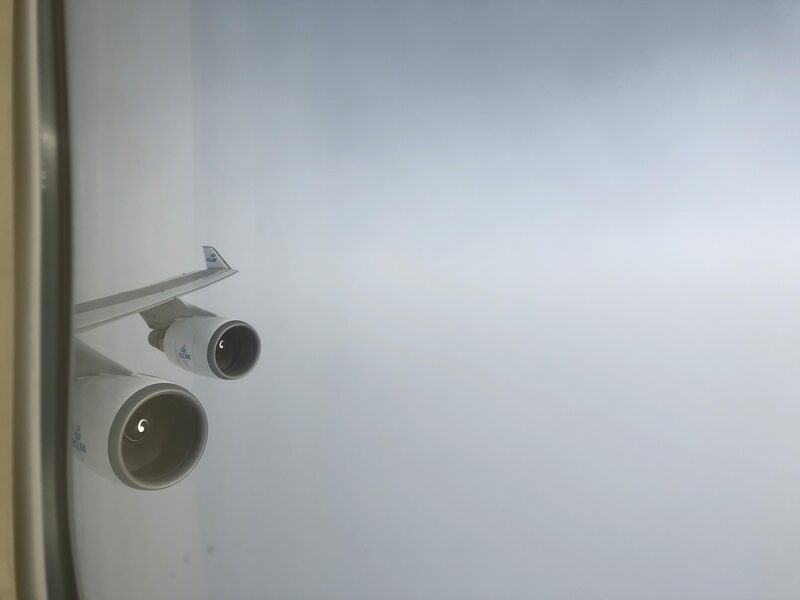 And finally 1 hour 40 minutes before landing, the crew began the pre-arrival meal service. The grilled salad was chilled and quite tasty. 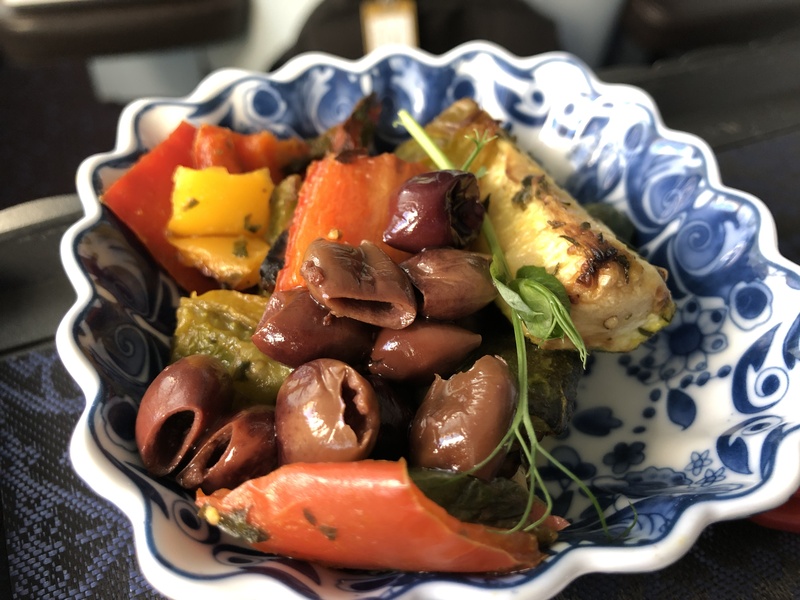 I added some olive oil to the veggies and it made it even better. I went with the latter since I had plenty of meat for the day already. 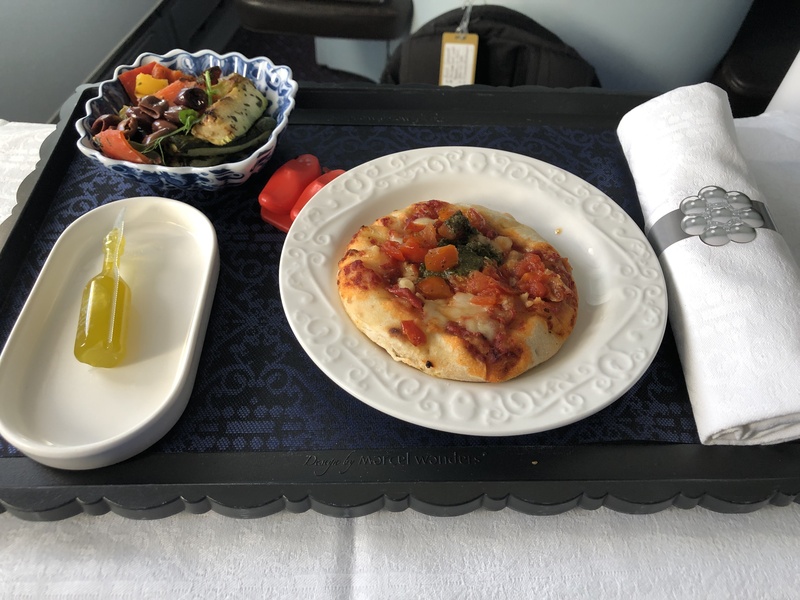 The pizza was slightly over lukewarm and the crust was fairly hard but the flavor was good for an airplane pizza. 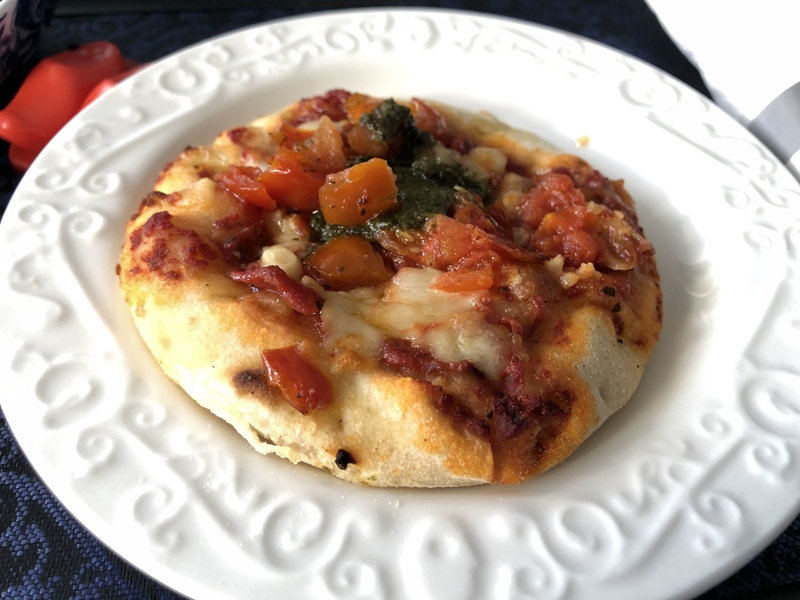 I tossed the remainder of the olive oil around the pizza and it added another depth of flavor which I enjoyed along with the rest of the pizza. 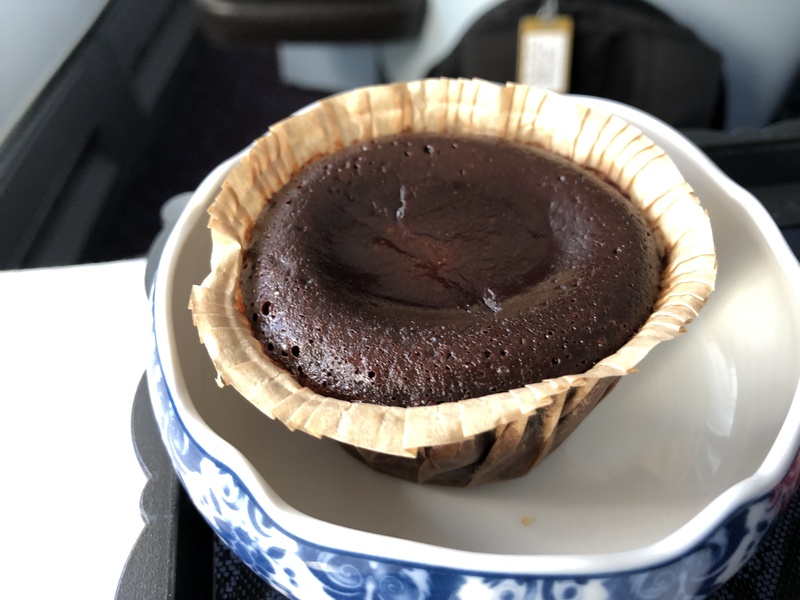 I’m not sure what that translates to, but this was definitely a lava cake. Man it was hot in the center and melt in your mouth good. It was definitely rich and very tasty. Honestly, this was another great meal across the board and I enjoyed too much. It was just that good. Across both meals, color me impressed with the food. 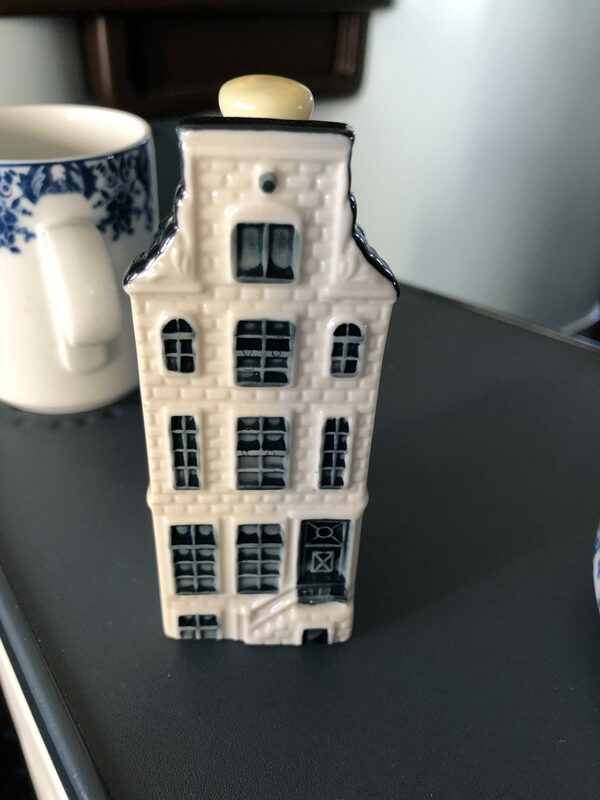 As is a tradition on KLM long haul flights, the crew brought around Dutch houses filled with Dutch gin shortly after. 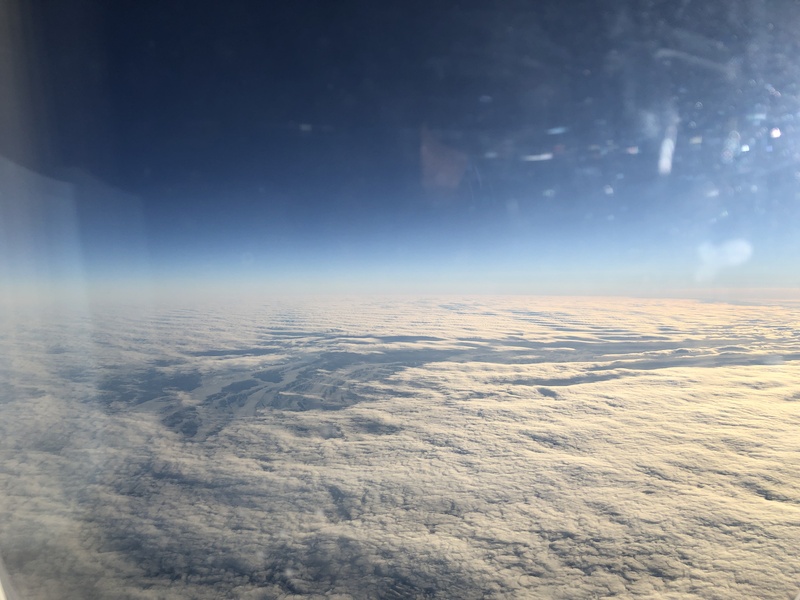 I have to say across the board the service was good in the nose section of the flight. 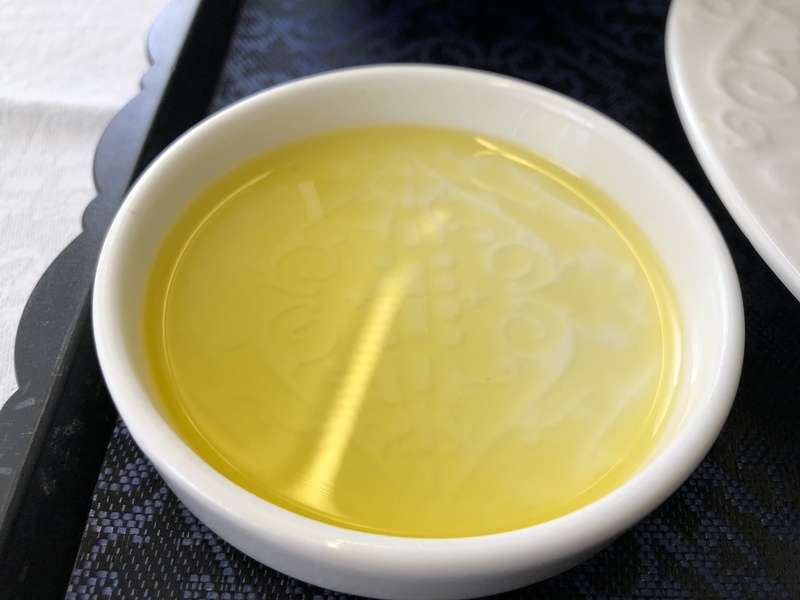 The only blunder was that for about 30 minutes after meal service ended, the crew were chatting in the galley amongst themselves and everyone’s used trays, glasses, napkins, and silverware remained on their trays and consoles. But that wasn’t a big deal anyways. 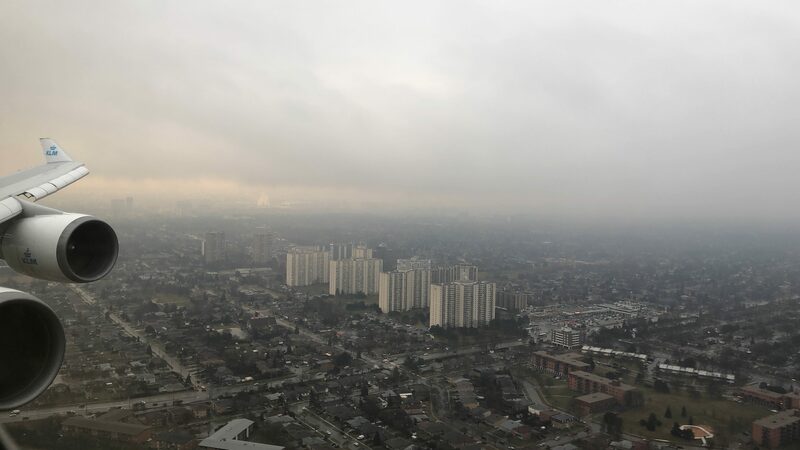 Finally, we began our descent into a rainy Toronto. 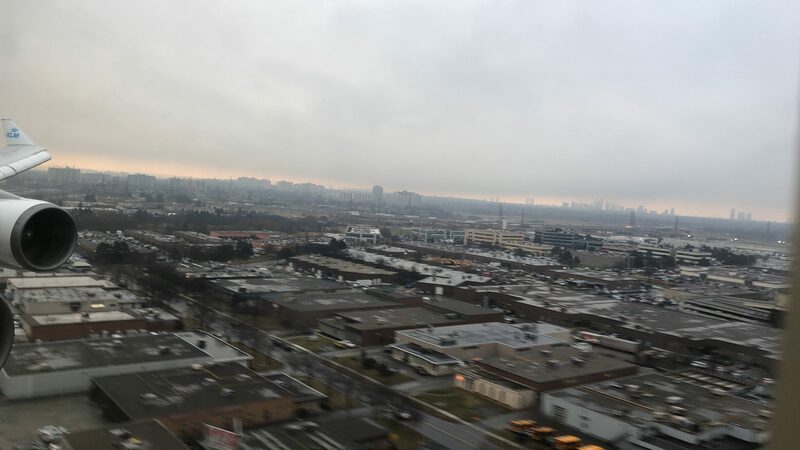 We had mostly good views of the city and suburbs on our final approach into Toronto. 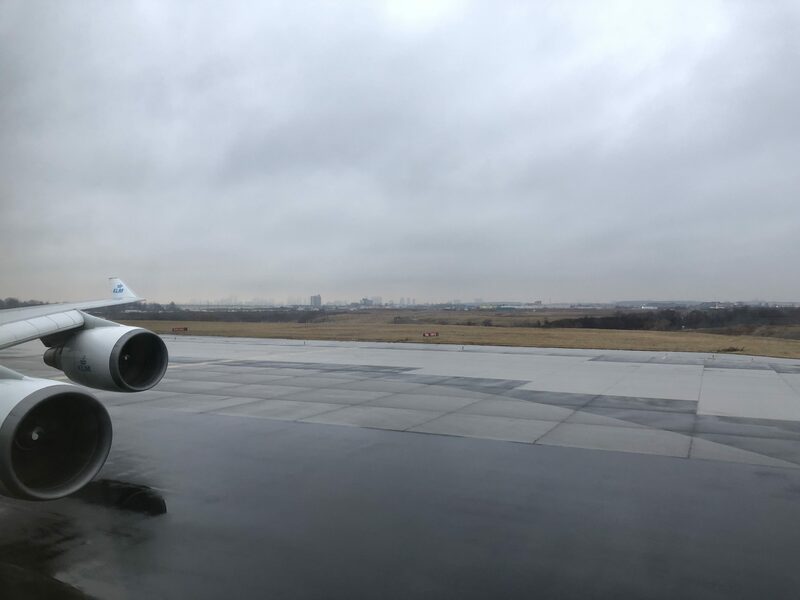 We had a smooth touchdown on runway 24R, and taxiied to terminal 3, which I believe is where all the non-star alliance intercontinental and transborder flights leave from. 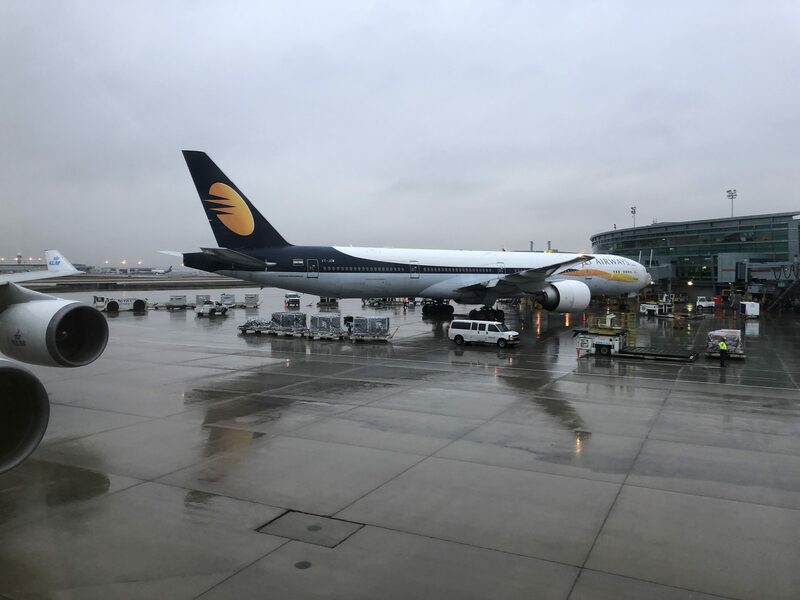 We parked right next to a Jet Airways which also came from Amsterdam. 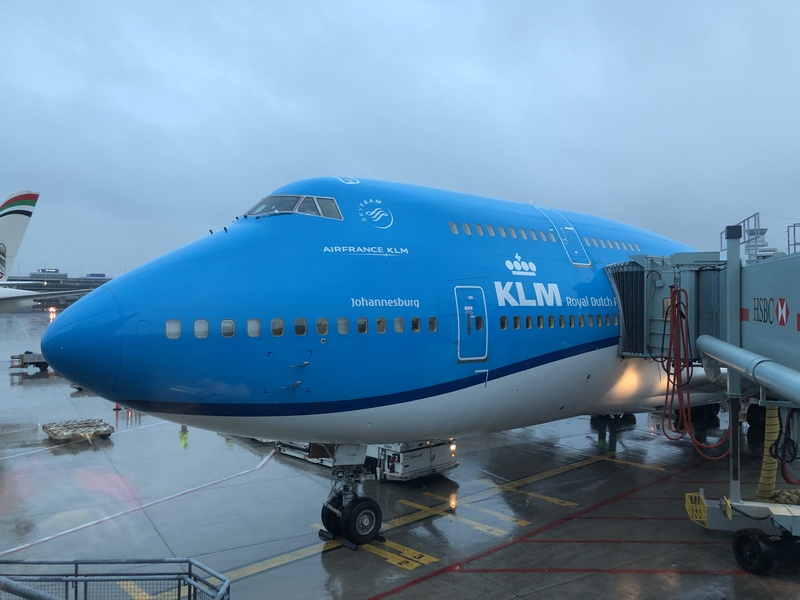 And here’s one last view of my lovely queen of the skies before running off yet again, to terminal 1 for my United flights. 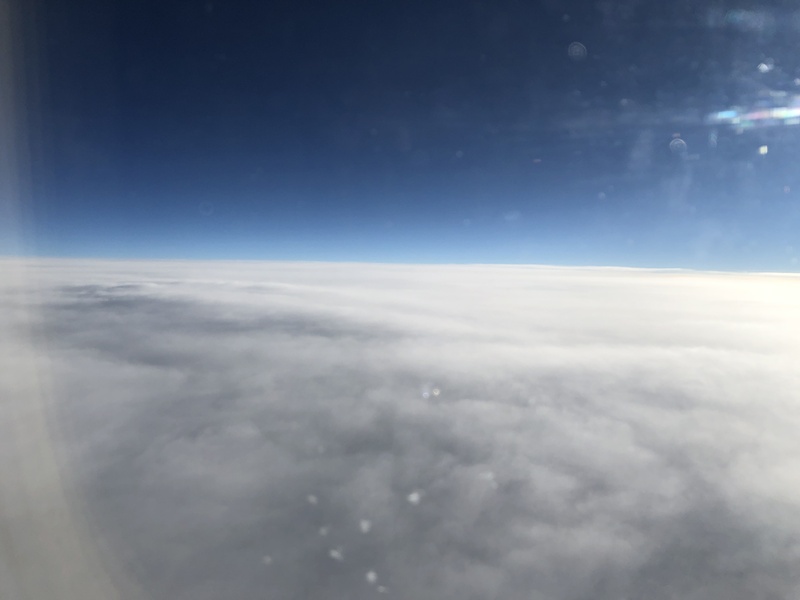 Man, I was very very happy with this flight. 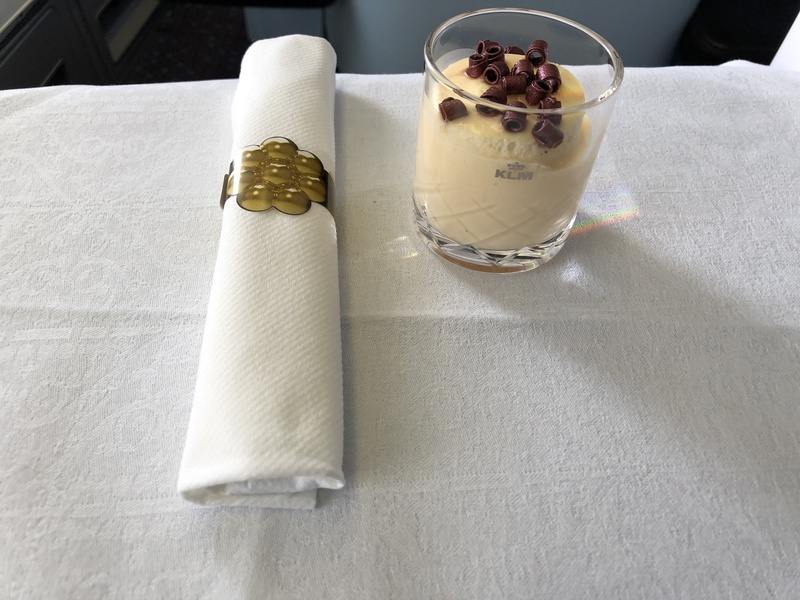 I had the best seat on the plane (in my mind), great crew, great food across the board, a sufficient soft product, and a 747. I can’t ask for much more. 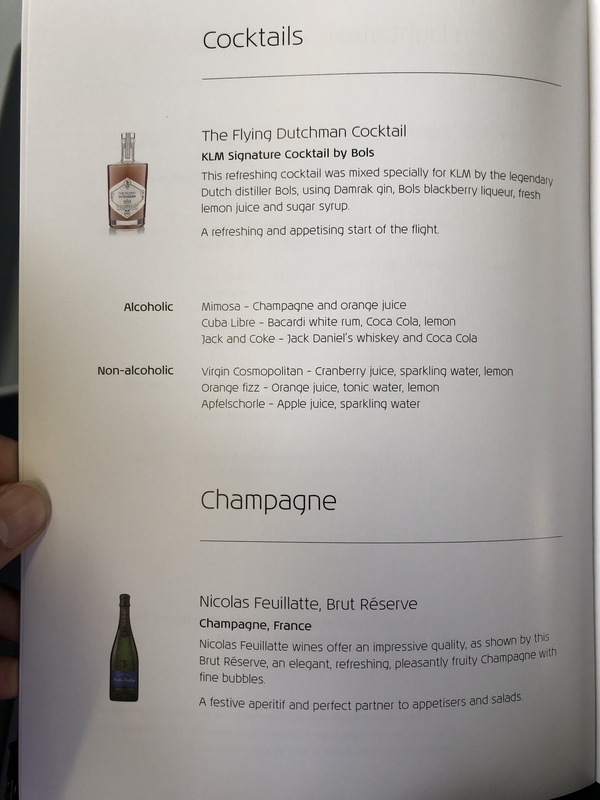 If I had to fly KLM again long haul in business, I absolutely would! 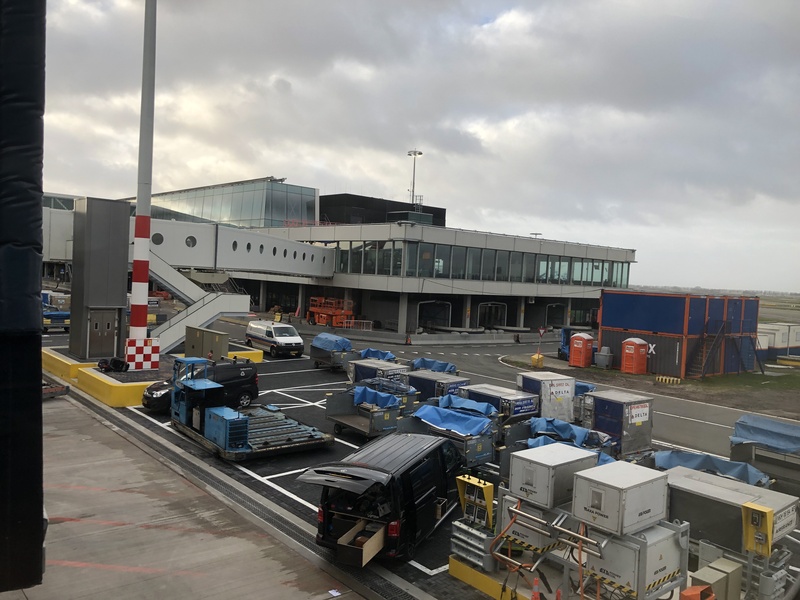 Odds are I probably hope to in the future since I didn’t get to check out that new non-Schengen lounge in Amsterdam!